John Lewis, “John Lewis,” Histories of the National Mall, accessed April 22, 2019, http://mallhistory.org/items/show/95. John Lewis was a civil rights activist who helped plan the March on Washington for Jobs and Freedom in 1963. At age 23, Lewis was the youngest speaker at the March. His strongly-worded speech criticized lawmakers and the President for not doing enough within their powers to stop racial discrimination and the attacks on non-violent protesters across the American south. Other speakers and organizers objected to parts of Lewis’s speech, and he reluctantly cut the most confrontational phrases. Even with these changes, Lewis’s speech was still a rousing call to action. Library of Congress Prints and Photographs Division. View original photograph. John Lewis was born in Alabama in 1940, the son of African American sharecroppers and one of eight children. As a teenager, he followed the news about the 1950s Montgomery bus boycotts on radio. While student attending American Baptist Theological Seminary and then Fisk University in Nashville, he began participating in civil rights sit-ins. 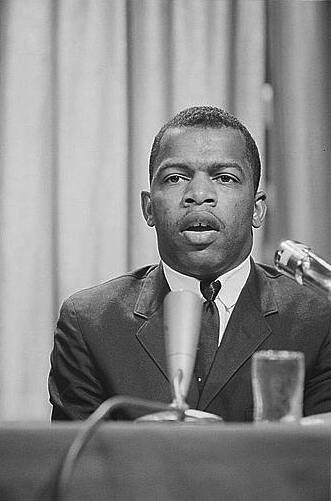 In 1960, he was one of the thirteen original “Freedom Riders” who attempted to travel from Washington, DC, to New Orleans, LA in 1960 as an integrated group. They were constantly threatened with violence and occasionally were attacked. Lewis was one of the founding members of the Student Nonviolent Coordinating Committee, established in 1960 by college students. Lewis was elected as chairman of the group in 1963. As chairman, he helped to organize the 1963 March on Washington for Jobs and Freedom and the 1964 Mississippi Freedom Summer that helped African Americans register to vote despite threats of violence and governmental resistance. In 1965, Lewis and fellow activist Hosea Williams led a group of marchers across a bridge leading out of Selma, Alabama. On the far side, state troopers and newly deputized white men waited and attacked them. Police fractured Lewis’s skull, leaving him with permanent scars. Lewis left SNCC in 1966 to become the community affairs director of the National Consumer Co-op Bank in Atlanta. In 1977, Lewis ran for Congress in Georgia’s 5th district. He lost, but soon after was appointed associate director of ACTION, a federal volunteer agency similar to AmeriCorps. He ran for Congress again in 1981 and this time was elected. Lewis still serves Georgia’s 5th district. Lewis received the Presidential Medal of Freedom in 2011 for his lifelong commitment to human rights advocacy.